Lightweight insulated sliding doors for cold stores at temperatures above zero. Polyester facing. Leaf weight < 120 kg: 2420 rail. • Thickness 60 or 90 mm. • Polyester frame coloured grey or white (please stipulate at time of order)(2). • 304 grade stainless steel frame, U profile, in 3 parts (12). • Assembly using PU bonding sealant. • FERMOD joint n° 8511 on 3 sides (7). FERMOD lower sealing strip n°250 (8) for 2320 rail. FERMOD lower sealing strip n°3350 (8) for 2420 rail. • FERMOD sliding rail n°2320 (up to 80 kg) or n°2420 (up to 120 kg) providing a seal by pressing the joint against the frame (11). Rail fixed on the panel by studs and composite counter-support. FERMOD inner and outer handles fitted on delivery. 2 guide shoes to be fixed to the floor. Opening and closing stops fitted on delivery. • 304 grade stainless steel frame, U profile, in 3 parts. • Fitting on masonry (stainless steel frame). - Standard RAL colours: White RAL 9010 – Red RAL 3000 - Blue RAL 5012 - Yellow RAL 1018 - Green RAL 6019. - High-security cylinder for master key chart (European profile). 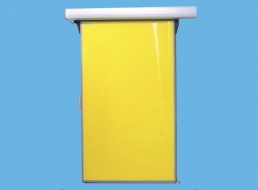 control cabinet (220 V or 380 V - please stipulate at time of order).